The mining town Røros is on UNESCO’s list of World Heritage Sites. It is known as Bergstaden, and renowned author Johan Falkberget’s birthplace. The characteristic Røros church is majestically located on top of the hill, and the cute wooden houses witness a town full of traditions. Equally are the Norwegian Bunads full of traditions, and Røros has its own Rørosdrakt. It started when the present Rørosdrakt Committee was in lack of costumes prior to a dance performance. 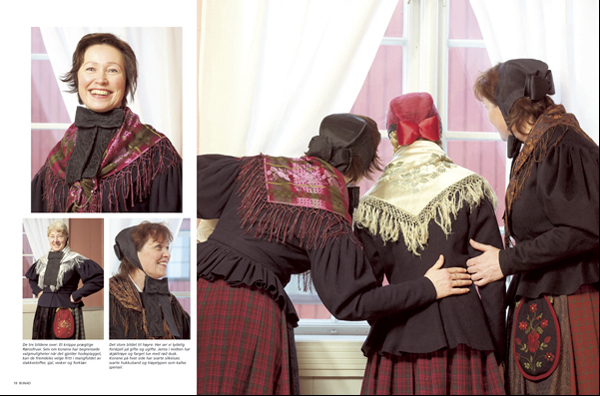 They started collecting information about old clothing traditions which resulted in an independent national costume. The Committee conducted the difficult task of registering old garments. 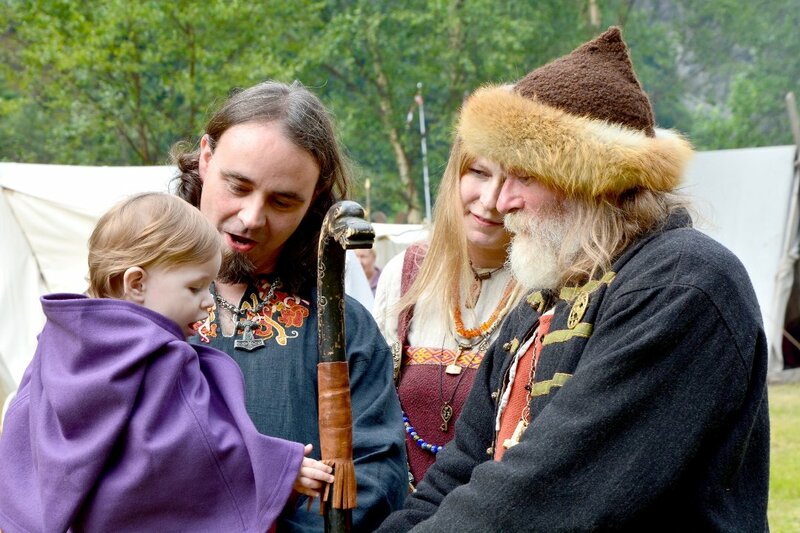 Eventually, up to 4,000 garments from the Røros district were registered. Every garment is indexed with images and data on the time of use, place and material details. Most materials were found in museums and in private homes. The most characteristic piece from Rørosdrakten is the headgear called ørhuve. It can be used by both married and unmarried women, but the girls can be more colorful than their married sisters. The girl hats with a red ribbon at the back is called dusk. It can be made from patterned silk or silk embroidery. Every Rørosdrakt is handmade, and none are identical. The hukkuband is a tied bow below the chin made from a wide silk ribbon. The girls can choose between many colors and patterns, while the wives use a black cap, dusk and hukkuband. Several hats have blue and white bead embroidery. Some believe that these hats have been used by older, unmarried women while others think they might have been used by girls in grief. It is customary to wear a shirt called skjøttrøye. It has got tight sleeves, pleats in the back and split joints in the front. Married women wear a tight shirt called spensel. The sleeves are wide at the top and narrow from the elbow down to the wrist, known as Gigot sleeve. The skirt is woven in checkered patterns, and colors may vary. The shawl is embroidered in various patterns and colors with long fringes. An ankle length apron is also part of the characteristic Rørosdrakten. Although the married women have limited choices when it comes to headgear, they can still choose freely from diverse fabrics, shawls, bags and aprons. 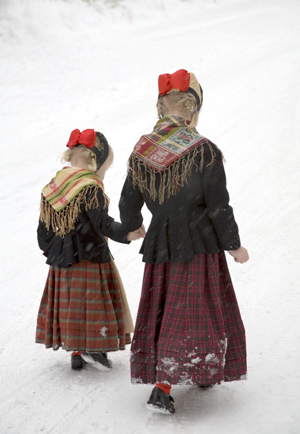 These little girls are also wearing the beautiful Rørosdrakten with all the details in place: Ørhuve with dusk and hukkuband, skjøttrøye, checkered skirt, apron and silk shawl with long fringes.